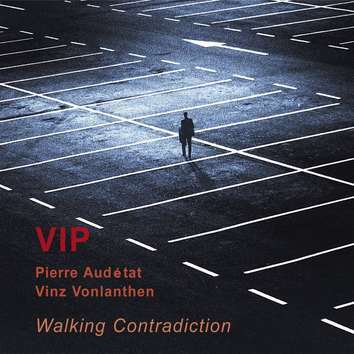 Pierre Audétat, samples/keyboard; Vinz Vonlanthen, guitar/vocal. VIP have brought us an assemblage of quite dissimilar, sometimes astonishing dispositions by way of an assortment of ambience à la Brian Eno with hints of Meddlefrom Floyd and perhaps who knows what film scores not yet written…...? The music awakens a desire to not call it music but sounds, and to call it Avant rather thanInnov, but that I think is just the old categorization problem raising its head again. It isn’t necessary to one’s listening or enjoyment and track 8, Melancholic Spy, should dispel any worries that might arise on that account. The music has strength generally, yet in part reveals a certain, though occasional, diffidence, perhaps due to the constant pace, a relentless slow-walk through time and maybe space, adrift as in 2001. There is musing and there is brooding, contrary flashes of tautness and strain as well as the lingering wish to be free of this weighty milieu, the walking contradiction of Scorsese’s Taxi Driver.